LawNewz, a website run by legal correspondent Dan Abrams, agreed that the company acted illegally when it forced the passenger to de-plane. The Department of Transportation's Office of Aviation Enforcement and Proceedings said in a statement Tuesday that it had begun reviewing what happened on the flight. “The Department remains committed to ensuring that airlines comply with consumer protection regulations and will not speculate during the review process on this matter,” it said, explaining that it would determine whether or not the airline complied with the DOT's "oversales rule." 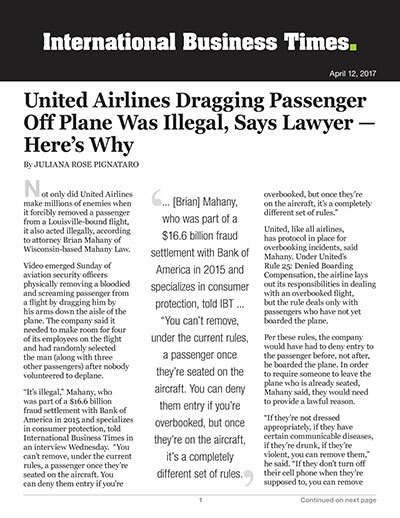 The statement noted that “it is legal for airlines to involuntarily bump passengers when there are not enough volunteers” and that “it is the airline’s responsibility to determine its own fair boarding priorities.” It also explained that the airline would have to give all passengers who are bumped involuntarily a written statement describing their rights and detailing how the airline decided who was bumped, and that "the Department mandates compensation and other protections for passengers who have confirmed reserved space on a flight." The Department of Justice also said it was reviewing the incident.